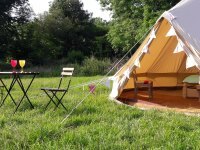 Our 5 metre bell tent has been prettily furnished with a king size bed, a single futon and roll out mattress so can accommodate 2 adults and 2 children. All Bedding is provided, just bring your own towels. Small well behaved Dogs are also welcome. 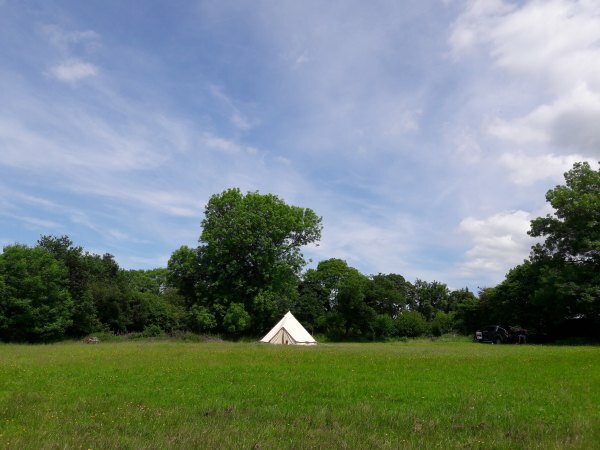 There is a covered kitchenette with everything you need, including, gas hob, cool box (Ice packs provided), hot & cold running water and a picnic bench. A Firepit (logs included) to cook on and snuggle around in the evenings to watch the glorious sunsets, and be amazed by the star filled sky. You will have a one acre field all to yourselves far from any roads where the kids and dogs can play and run freely. 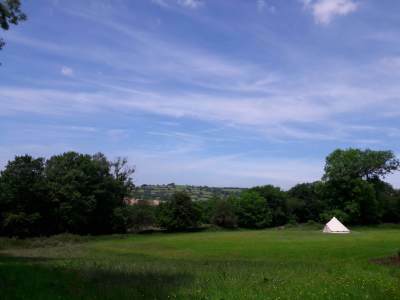 If you fancy stretching your legs a bit, we have a further 22 acres for you to explore. Go and say hello to our two horses and three very friendly goats. You can even collect eggs from the chicken coup! You have your own lovely hot shower and a compost loo located just a few metres from your tent. Whilst there is no mains electricity, the kitchen, shower and loo are lit with solar powered lights. There are also lots of fairy lights scattered around to give it a magical feeling. Wood for the campfire is provided so are the ice packs for the coolbox. There is no vehicle access to site and secure parking is 100m away but, we can deliver you and your luggage by 4x4.